Imagine a product that could change the flow of your life force energy through the right physical, emotional, and spiritual body. 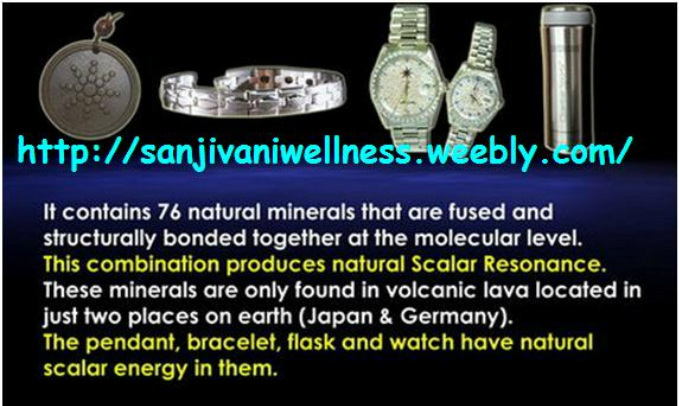 SANJIVANI WELLNESS'S SCALAR ENERGY AND BIO MAGNETIC PRODUCTS changes these imbalances which means changing the very basis of the world around YOU. Imagine a product that you only paid ones and benefits for 3 generations. 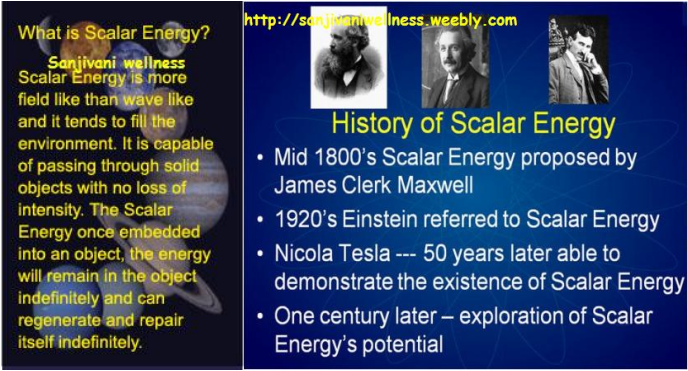 Protect yourself, your children and grandchildren with this amazing SCALAR ENERGY AND BIO MAGNETIC PRODUCTS. Our innovative and revolutionary energy products has/have been exclusively created to help you achieve and maintain a harmonised and balanced state of mind and body. 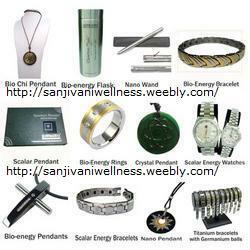 WE ARE THE BIGGEST WHOLESALE BULK SUPPLIER AT DIRECT FACTORY RATES ACROSS INDIA FOR BIO MAGNETIC & QUANTUM SCIENCE TECHNOLOGY ENERGY PRODUCTS LIKE BIO-MAGNETIC BRACELETS, DOUBLE LINE BRACELET, WITH RIGHT GAUSS POWER, QUANTUM SCIENCE PENDENTS, SCALAR ENERGY PENDENTS WITH GOOD ION POWERS AS REQUIRED BY BODY, BIO DISC, NANO WAND, MST PENDANT, BIO ENERGY CARD, NAZAR RAKSHA KAWACH, QUANTUM NANO FLASK, ALKALINE STICK, FACIAL WAND, BIO AURA PENDANT, NANO HEALTH CARD. OUR QUALITIES PROVEN RANGE OF PRODUCTS ARE SOURCED FROM BEST MANUFACTURER OF THE WORLD. Quantum Science Pendant is made from natural minerals that are structurally bonded together at a molecular level. 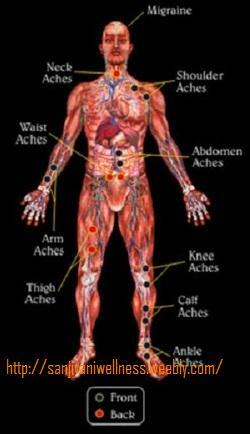 It produces scalar energy that helps to enchance the body's biofield. The Quantum Science Pendant promotes positive flow of energy and helps to maintain energy balance. It helps to restore energy that has become weak in the body. By restoring the energy balance in the body this pendant helps one to maintain health and well-being. An easy natural detox.A detox foot patch is a natural detox. This natural detox comes in the form of an adhesive patch and is placed underneath the foot at night. The purpose behind using a detox foot patch as a means of body detoxification is to provide a waste product outlet that may hang around on the individual’s body. A detox foot patch contains natural ingredients which works in such a way that it detoxifies the body from pulling out different toxins that are causing stress, fatigue and other related health problems. In fact, this kind of foot patch is frequently used in various regions all over Asia.The success of using body detox foot patch for body detoxification is seen on its increased number of usage rate in Asia. •Dispels toxins accumulated in circulation system, promoting functions of circulation system and strengthens immunity. Nano Energy Flask is used to Energizing Water, Juices, Herb Teas. The Biomagnets build in this Cup are made from Pearl calcium ion and natural non-Inert material which radiates infrared ray and negative ions in water releasing mineral element such as Ca, Mg, K and Na,changing the common purified water into nanometer activated water. Nano activated water is alkaline in nature and has strong penetrability and solubility with negative potential. 5 in 1 Titanium Bio Magnetic Bracelets Are Nowadays Widely Used To Solve Many Present Health Problems And To Enhance Day To Day Living. Bio-Energy Bracelet are designed with features that incorporate the advantages and distinctive effects of Healthy Elements Like MAGNETS + FIR + GERMANIUM + NEGATIVE ION. This is a Holistic Healing Wellness Jewelry. This product produces scalar energy that helps to enhance body’s bio-field. This pendant is widely used as it promotes positive flow of energy and helps to maintain energy balance. Also, it helps restore energy and well-being of a human being. Our clients can avail this pure pendant from us at cost effective prices. What is FIR + NEGATIVE ION Health Card? FIR ceramic coating method using the unique bio-ceramic powders. The bio-coated card has served kinds of medical functions such as the improvement of micro-blood circulation. Relieve the stress and fatigue. Activate water molecules in our body. A revolutionary natural energy generating device, the Bio Disc is the product of technically-engineered natural minerals that have been structurally bonded in glass and are capable of producing scalar (life) energy frequencies. This long-lasting natural scalar resonance has the ability to be transferred to and rejuvenate the molecular structures of all liquids. Put simply, the energy created by the Chi Disc can cause liquids to become more hydratious, taste better, and to have a longer shelf life. Drinking a glass of water which has been placed on top of the Chi Disc, or pouring water over the Disc can help you detoxify and hydrate all body cells, increase the amount of oxygen in your blood, and enhance your immune system. You can also sleep better by placing the disc in the center of the bed, or energise yourself by bathing with a bio disc. The healing possibilities are endless. This is a very simple way to put some chi back into your life. E Cigarette which gives smoker's the freedom and pleasure of smoking anywhere even with the recent ban on smoking. It uses advanced micro-electronic technology to give its users a chance to smoke in a much healthier way as it does not contain tobacco. This in turn basically means that the smokers can smoke without being exposed to the 4000 chemicals like tobacco, nicotine, tar, carbon monoxide etc. present in a traditional cigarette. The E Cigarette is a pollution free reusable device without any carbon monoxide discharge therefore, dismissing any harmful effects like second hand smoke. The E Cigarette is Eco-friendly and also reusable so there is no problem with disposing of cigarette butts and there is no ash. Health E Cigarette looks like a traditional cigarette. The white part is a rechargeable lithium battery & the filter part is a replaceable cartridge which holds the flavored liquid .The battery and the cartridge are attached using an atomizing chamber. When the user inhales through the device, the air flow is detected by a sensor. A microprocessor then activates an atomizer, which injects tiny droplets of the flavored liquid into the flowing air and vaporizes it. This produces steam which is inhaled by the user. The addition of propylene glycol to the liquid makes the steam resemble normal cigarette smoke. The microprocessor also activates an orange LED at the tip to simulate real smoking experience. Each cartridge is equivalent to approximately 15 - 30 traditional cigarettes. change tap water into alkaline water without using electric power. Alkaline Ion Water Stick contains tourmaline ceramics, water soluble calcium carbonate, coral fossil, dechlorine ceramics and black stone. These materials make water healthy and testy. Water is essential to human being. But now water contains chlorine, heavy metal and it is far from tasty water. That is why we have developed Alkaline Ion Water Stick. Alkaline Ion Water Stick changes normal drink water into healthy and tasty water. Alkaline Ion Water Stick contains natural ores and these ingredients are dissolved out into water. These ores decompose and remove chlorine and other unpleasant odors as well as alkalinize water. How to use Alkaline Ion Water Stick ? It is very easy. Just put the stick in to water bottle, and wait for 15 minutes. Then you can drink alkaline water with pH8.8.-8.6. We can provide you at reasonable rates around the world. Natural health benefits with natural future technology. You Can Be, Do, and Have Complete Health You Wish! Sanjivani Wellness's Scalar & Bio Magnetic products is an easy-to-use tools that produces extraordinary results using ordinary tap water & water inside body. It's Science (and a whole lot more)! Ever since 1986, Japanese researcher, Dr. Masaru Emoto has experimented with the incredible properties of water. 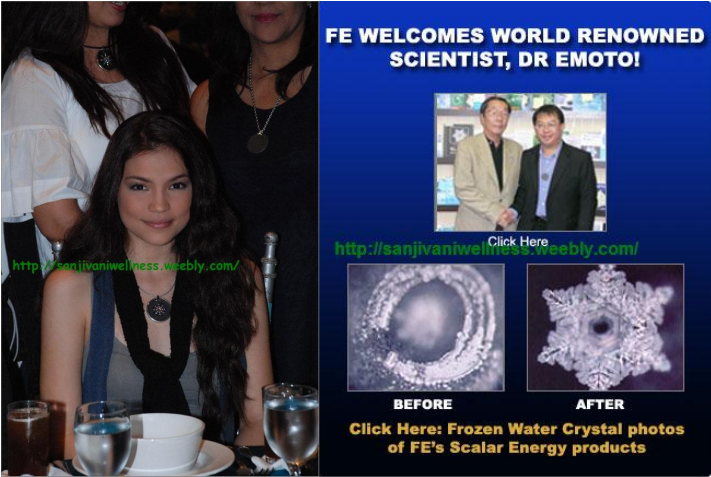 Please take a moment to watch this 6-minute video that explains Dr. Emoto's work. Human cells consist of 65-90 percent water. Vibrations traveling through water transfer energy, information, and vibrational frequency from one cell to another. OK, so how does that help me, you say. It has been demonstrated by Dr. Emoto in the video above, as well as from many other esteemed researchers and scientists, that water is very programmable. Amazingly, water can be used to store data and when erased of previous imprints or programming, it becomes a virtual blank slate. By applying ‘blank slating’ to the subconscious mind, one can erase doubts, fears, blockages or burdens, including those beyond our conscious knowledge. More about this later. Our range of products utilizes water as the catalyst to bring about your desired objectives for Health, Harmony and the type of life you want to live! 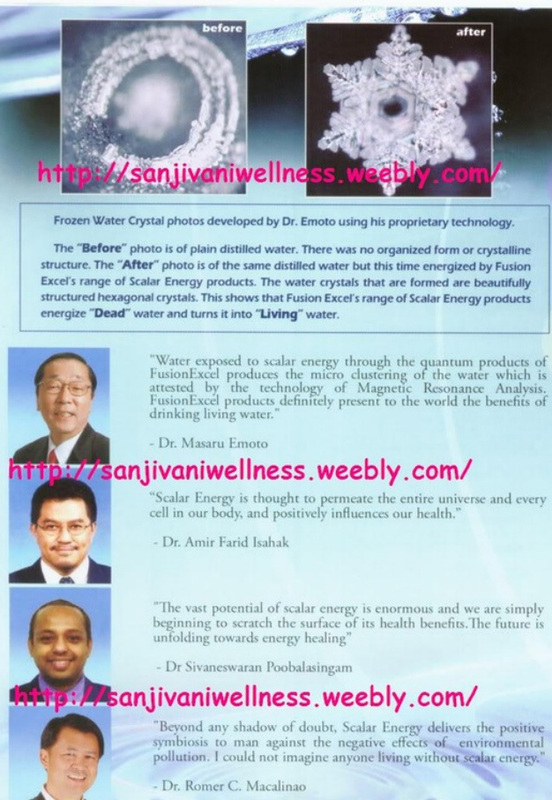 It sounds almost magical, but believe it or not, Sanjivani Products actually reprograms water to energize live water. © Copyright SANJIVANI WELLNESS 2010 -2011 All rights reserved. Do not duplicated text and/or pictures without written permission.